Tampa Sinkhole Claim Lawyer | Williams Law, P.A. Have you begun to notice damage to your property such as cracks in your walls, steps and foundation? The damage may be the result of sinkhole activity occurring beneath your property. If so, it will be important to demonstrate that the damage to your property is structural in nature in order to get the full benefit of your insurance coverage. At Williams Law, P.A., in Tampa, Florida, we will work with you to make sure you get the full coverage you deserve, despite the insurance company’s desire to deny your claim or offer to only pay for cosmetic damages. We recommend you consult with a knowledgeable attorney before agreeing to any settlement or signing any papers with your insurance company. Solution sinkholes – Occur in areas where limestone is exposed at the surface, or is covered by thin layers of soil or sand. Results in a gradual downward movement of the land surface and the development of a depression that collects increasing amounts of surface runoff. Cover collapse sinkholes – Occur where a solution cavity develops in the limestone to such a size that the overlying cover material can no longer support its own weight. When a collapse occurs, it is generally very abrupt and can be catastrophic. Cover subsidence sinkholes – Occur where the cover material is relatively incohesive and permeable, and individual grains of sand move downward in sequence to replace grains that have already moved downward to replace dissolved limestone. How Is Sinkhole Damage Repaired? For over a century, Florida has collected information on sinkholes, underground caves and springs within its borders; however, in the last few decades, the problem of sinkholes has worried homeowners, troubled insurers and prompted new amendments in Florida’s property insurance laws. Starting with Florida’s well-publicized sinkhole incidents in 1981, the controversy has left many home owners seeking answers and remedies to their sinkhole problems. According to research from the University of Central Florida‘s Florida Sinkhole Research Institute, the Sunshine State is riddled with millions of underground cavities created by water erosion. While these cavities have formed over millions of years, a critical event can cause the limestone to collapse. Sinkholes can result in loss of real property damage to transportation infrastructures and cause ground water contamination. As sinkholes and other ground movement issues can result in denied insurance claims and costly repairs, some property owners have resorted to find alternatives ways of dealing with sinkhole issues. As there are different types of sinkholes, repair may be possible; however, treating these geological nightmares will vary, because repair will depend on how extensive the problem is. Small holes may be able to be filled with soil. But, this do-it-yourself method may risk the property owner’s safety if the hole is not properly tested and defined. In cases where the small hole is simply the tip of the iceberg, help from a landscaper, contractor or even an engineering company may be necessary. For more complex sinkhole issues, sinkhole repair companies may be able to inject grout into the hole to fill the depression. If the potential harm is greater, elaborate systems of pins, plugs and porous concrete can be used to fill the sinkhole. In those cases where ground water may be impacted, property owners will need to obtain an Environmental Resources Permit. Caveat emptor! 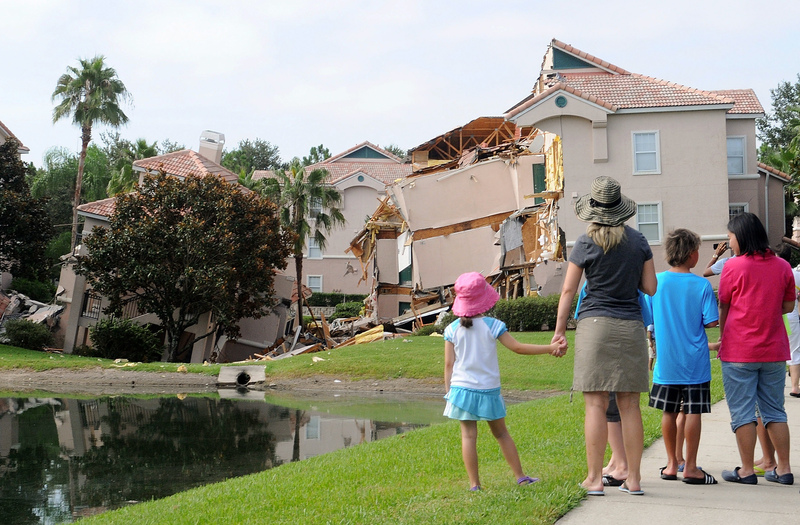 Buyers should beware, especially if they are interested in homes in sinkhole-prone Florida. Affecting agricultural and residential areas, sinkholes are a looming geological problem for Floridians. While newswires are filled with stories about homes being deemed uninhabitable, roads collapsing and property being swallowed into deep pits, hope lies in simple methods and skilled professionals, who can fill or fix sinkholes. Even when an insurance company agrees to provide coverage for damage from sinkhole activity, it may still attempt to pay as little money as possible. This can mean an offer that is substantially less than the damage to your property and less than the amount needed to make the proper repairs. Oftentimes, the insurance company will offer a repair method, which is faulty and/or inadequate to properly repair the damage to your property. The insurance company may recommend or agree only to pay for the least expensive repairs. If your insurance company confirms sinkhole activity, the insurance company will solicit repair estimates from several repair companies. Most of the time, these companies recommend grouting (the pumping of concrete under the ground) as the sole method of repair. Your insurance company will take the lowest repair estimate and usually offer to pay you that amount of money to settle your claim. The serious problem with this procedure is that neither the insurance company nor any repair contractor can adequately calculate the amount of grout they will have to pump into the ground. If the grouting process takes longer or is more expensive than initially forecasted (which is often the case), the homeowner may be left with no option but to come out of his own pocket in order to complete the proposed repair. As you pursue the insurance benefits you deserve, it is important to understand the terminology that will be used by the insurance company, lawyers and others as your case unfolds. From your perspective as a claimant, the most important term is “sinkhole loss.” If you have sinkhole loss as described in your policy, you will be entitled to benefits such as repair expenses. The fight in these cases often centers around whether there is evidence of sinkhole activity on the property. To avoid covering damages for a sinkhole loss, insurance companies will often try to claim the damage is not structural damage to a load-bearing element, but rather cosmetic damage that is much cheaper to fix. Or, they will seek to limit structural damage to a very narrow definition so they can avoid their share of responsibility. If you have noticed damage caused by sinkhole activity on your property, you may be wondering what your options are for finding a solution. The first thing you need is an experienced attorney who will fight for your right to reap the full benefits of your property insurance policy. It is important to realize that when it comes to finding solutions to sinkhole activity and its resulting damage, the insurance company will have one goal in mind: resolving your claim as cheaply as possible. This does not mesh well with your goal of finding a lasting solution to your sinkhole damage. Insurance companies will often push for grouting, the cheapest sinkhole repair method, a method of repair that is often not guaranteed by the contractors who perform the procedure, and is viewed as inadequate by structural engineers. A much better solution in most cases is underpinning. This method is considerably more costly than grouting but often provides a long-term, if not permanent, solution to the sinkhole activity on a property. Unlike grouting, underpinning often comes with a warranty. For questions regarding Florida sinkhole laws, inquiries into whether you have sinkhole damage or for assistance with a sinkhole issue, please call for a free, confidential consultation and case evaluation with an experienced sinkhole claims attorney by calling us at (800) 451-6786 or submitting an intake form online. We look forward to assisting you.